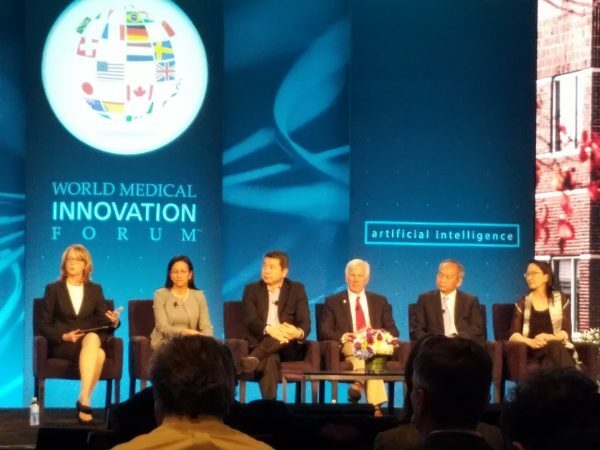 This past week, clinicians, researchers, administrators, and entrepreneurs came together for the 2019 World Medical Innovation Forum in Boston hosted by Partners HealthCare Innovation. The focus was the present and future of artificial intelligence (AI) in healthcare. A great deal of the value of AI in clinical use remains in the early stages. Many sessions emphasized that AI and machine learning (ML) software can contribute outside of direct clinical practice. AI and ML are tools used to build solutions; they are not solutions. AI and ML offerings must be less mysterious. Users need to be able to evaluate and audit results and the processes that led to those results. Clinical process deployments are still slow and relatively rare, although they get a lot of attention. Operational and administrative offerings will deliver value to a health system long before transformational clinical tools are available. All eyes are on AI in clinical settings but the list of nominees for the annual Peter K. Ranney Innovation Award demonstrates growing interest and respect for less glamorous applications. Eleven of the eighteen nominees involved familiar clinical topics like image recognition, early detection of degenerative symptoms, and surgical assistance. The seven other topics, however, had broader scopes. Panels, such as Monday’s Mental Health, Smartphone Apps and the Promise of AI and Tuesday’s The Provider Back Office of the Future, illustrated current uses of AI in more prosaic applications, as well as the challenges of implementing AI software and tools. AI and ML tools are already in use in administrative and financial functions. Those areas are growing, including the recent $2M grant from Amazon to Beth Israel Deaconess for administrative, management, and operations-focused uses of AI. The large number of currently manual tasks in healthcare administration and finance that can be addressed using sophisticated process automation represent significant opportunities for AI and ML developers. This conference focused a lot of attention on AI and ML’s opacity. Providers want to be able to understand where diagnoses or recommendations come from before they will trust a tool in everyday practice. The more transparent and auditable platforms or products are, the faster systems and providers will be willing to adopt them. Speakers at many panels expressed the importance of understanding AI and ML as part of a solutions toolkit, not as a solution by itself. Speakers emphasized the importance of rigorous project management fundamentals, identifying a problem and seeking solutions. The power and flexibility of AI and ML means that solutions increasingly include those elements, but the solution remains the most important thing, not the tools used to achieve it. More sophisticated computing technology, better access to data, and new programming tools have made the use of AI and ML an inevitability. No one seems to be able to pinpoint when or how an obvious transformation will occur. It’s happening now, with AI and ML components increasingly used in new technology and solutions whether we realize it or not. Breakthrough therapies and earth-shattering changes in treatment modalities are rare, and adoption is slow. When developers thoughtfully integrate AI and ML into coherent solutions for identified problems, they’re already here.